Portable Gates. Portable Security Gates. Gates Roll Away When Not in Use. 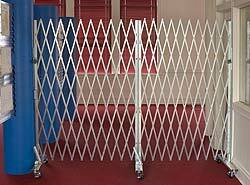 Heavy-Duty Portable Security Gates. Portable Security Gates extend up to 12' and are a quick and easy way to seal off any area. Need a Custom Portable Security Gate? No Problem!  no matter what your situation is, we can build a gate to your specs. IEP Portable Security Gates can be used virtually anywhere and any way you need them, including, sealing school hallways, closing elevator banks, restricting access in offices, factories or warehouses. And they're easy to collapse, allowing open, easy access again. And when collapsed they'll go through any doorway and can be stored in a closet! Portable Security Gates from Illinois Engineered Products are perfect for providing temporary access control in any area  including entryways, hallways  anywhere! Gates extend up to 12' and with 6' add-ons you can seal off an area of any width. 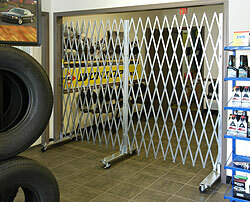 Use a starter gate from 6' to 12' wide, then simply use add-on gates for each additional 6' needed. And add lockable drop pins to add additional security for wide openings. When not in use, gates simply fold up and roll away for storage. They'll fit through a doorway as small as 28! Our Portable Security Gate can be rolled to a site and lock to a wall with the included locking bar. To remove the gate, simply unlock the locking bar and roll away out of sight! Gates roll easily on 3 rubber casters. Easy-to-follow installation instructions for Portable Security Gates (pdf). Complete specifications for our Portable Security Gates. 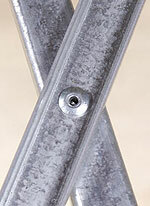 Complete listing of all available hardware and accessories for all Steel Folding Gates. Portable Security Gates easily collapse to go through any doorway. Click here to find a dealer in your area, get more information on Portable Security Gates and pricing. © 2007 Illinois Engineered products, Inc. All rights reserved.